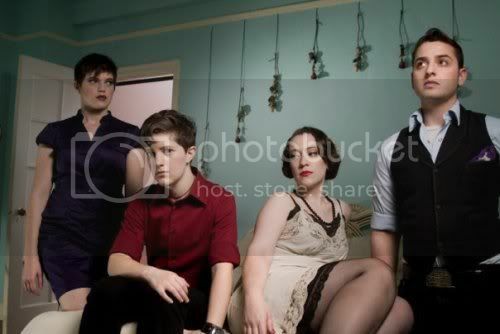 The Shondes (taking their name from the Yiddish word for "disgrace") are a rock band from Brooklyn and best known for potent political anthems and heartbreaking violin hooks. The foursome brings the sound and spirit of riot grrrl to its unique brand of Jewish-inflected music with an explosive and emotional live show. The Shondes approach each moment on stage with joy and passion, and offstage, band members Louisa Solomon (bass/vocals), Elijah Oberman (violin/vocals), Fureigh (guitar), and Temim Fruchter (drums) are outspoken in their communities. The Music - The Shondes have split stages with Electrelane, Rasputina, MEN, Erase Errata, Amy Ray, Joe Lally (Fugazi), Mecca Normal and Lesbians on Ecstasy. In 2008, The Shondes released their acclaimed debut, The Red Sea, produced by Tony Maimone (Pere Ubu, They Might Be Giants). Their last effort, My Dear One, was released less than a year ago on Fanatic Records. The band are in the studio now preparing demos which will likely be heard on stage in Austin. 2 Weeks Ago Their Van was Stolen! - The Shondes have always maintained a rigorous tour schedule. All that was put in serious jeopardy 11 days ago when their touring van was stolen. That's pretty crippling for a band that lives to play. The band started a Kickstarter campaign and their loyal fans have rained support on the band to keep things on track. In less than two weeks, more than 200 fans have helped the band nearly reach their goal of collecting $10K so they can buy a new road wagon. Web / Fb / My / Tw / Kick!